Maarup noticed that actually, the rise of the craft was not the only cause of the withdrawal of the light which surrounded it. He realized that the extent of the light around the craft decreased as if the craft was swallowing the light into its body, from a defined point located at the center of the bottom side of the craft, in which the light was engulfed as if it had been sucked into there. This part of the craft appeared clearly delimited to him, by a dark part of a diameter he estimated at one meter. He also saw some protrusion on the underside of the objects. Maarup did not want the first observation to be known by the press. He told his colleagues not to say a word. But the day after the observation, the journalist Bent Zachariassen of the newspaper Jydske Tidende went to the police station for his routine visit, hoping to get some information for the newspaper. When the journalist was about to leave, Maarup's brother couldn't resist to call him back, shouting "Sure, there is some news, as a matter of fact Maarup saw a flying saucer!" This is how the sighting became publicly know. It made the news in Jydske Tidende, then in Tv-Aktuelt, other magazines, Denmark radio and TV news, German TV. Maarup found that funny at the beginning, but he found out that he was often ridiculed, so he gave the pictures. The story became worldwide, even an newspaper of Ghana told the story. And although Maarup has been very careful not to use the words UFO or flying saucers at any time, headlines did headline on UFO and flying saucer. Hassled by the press, mocked in the media, he said that he understood how only the fact that he was a police officer made the story interesting, that he would not have considered that anyone could believe the story at all if he didn't wear a uniform, and that he regretted to have spoken about it at all. Maarup, following his official report at the police station, was sent to a psychiatrist, who did not find any reason to consider him mentally disturbed. 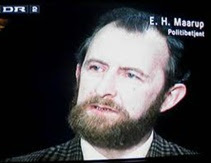 When several newspapers of Denmark and other countries published articles presenting him as a crackpot and a liar, all his colleagues Maarup protested, explaining that they know Maarup well and that it is a shame to calumniate him, and that they are all sure that what he told is the truth. The official investigation of his first encounter was lead by major Helden of the tactical command of the Danish Air Forces. The silliest explanation ever was then issued: the conclusion was that Maarup had witnessed the landing of a T-33 jet fighter/trainer. Maarup's report came to the attention of Erling Jensen, who lead the Danish ufology association S.U.F.O.I, and the case became further known through his mail exchanges with people from the French GEPA, a civilian ufology group - but whose members were often from the military - a sort of French equivalent of the American NICAP in these years. There were no "hard evidence" for the claims of officer Maarup. The photographs are only photographs, the car naturally cooled down to normal temperature, and he did not suffer any particular after-effect. There were no other witnesses. Summary: The 1970 sighting by police officer Evald Hansen Maarup near Hadersley, Denmark, during which he was able to take three photographs of the object, was widely reported in the Danish press and in the journals of foreign UFO organisations. His second sighting, almost precisely three years later, is less known but is of interest in view of its almost a duplication of the earlier incident. At 10.50 pm on Thursday 13 August Maampvil driving home in his police car, and had just turned east off the main road onto a secondary road. 'I had been driving about 10 km when suddenly the car was surrounded by a bright bluish-white light, and at the same time the car engine stopped. The lights of the car also went out, even the dashboard lights. I drove to the side of the road and stopped. The bright neon-like light outside was so dazzling that I could see nothing. With my arm shielding my eyes - to protect them against the light - I succeeded in groping my way to the radio. When I got the microphone and tried to call the station, it appeared that the radio was just as dead as any of the other electrical parts of the car. The temperature inside the car was increasing and it became pleasantly hot. How hot 1 cannot tell, but it could be compared to the heat you fee! when you drive against the sun on a summer day. After a while the light was rising. It was a conical light with a diameter at the bottom of about 4-5 metres. When I was bending forward and looking up I could see that the light cone ended at the bottom of the big grey thing. Not a sound was heard. After a few seconds the light was 'drawn' into the thing. It is difficult to explain how: the light was not extinguished, but the bottom of the light was rising so that it became dark beneath the cone. It took about 5 minutes for the light to be drawn up. 1 stepped out of the car and saw how the last remnant of the light cone disappeared into the bottom of the thing in a hole with a diameter of almost a metre. When the light had disappeared into the thing, this started moving. In a few seconds it vanished vertically into the air. It accelerated swiftly - still without sound. 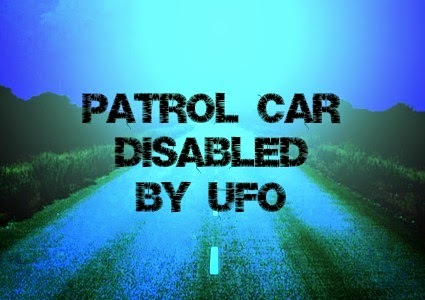 When the object moved away, all lights in the car's system returned. It started quite normally, and 1 was able to get in touch with the station. I reported to them what I had experienced. If I should describe the thing,! can only say that it was circular and about 10 m in diameter seen from my position below it. It had a luminous hole in the bottom from which the cone of light erupted. This hole was about 1 metre wide, consequently about 1/10 of the total diameter. The object had two extensions or domes on the underside, about 1.5 m in diameter. When I saw the thing through the windshield 1 will estimate it was about 20 m from me. When he reported back by radio to the police station, some wag replied, 'Should we come with a red hospital-admission note?' - the kind used when committing someone to mental hospital. This was the only occasion when Maarup was not taken seriously. When journalists questioned his colleagues on the force, all without exception said they believed his story. When Maarup arrived home, his wife thought he looked pale, so he told her of his experience though he had no intention of making it public. Next day, when his film had been developed and he saw that he had captured an image, he took it to Skrydstrup Air Force base. One of his colleagues - the one who had made the joke about the red note - informed the press, otherwise the story might not have got out. By the following evening he was being questioned both by the military and by journalists not only from Denmark but the world over, even from Ghana! As soon as Maarup's film was received at Skrydstrup AFB on the Friday evening, analysis began, and on Saturday a statement to the press said that the preliminary study indicated a spot of light in the first three pictures, while three more showed the road with the crash fence illuminated by headlights. There was no doubt they were consistent with Maarup's account. On Sunday it was announced that the photographs had been passed to Defence Command at Vedbaek, who were questioning radar operators and pilots who might have been on duty on the Thursday evening. That evening, Maarup heard the television news report that, according to Major Hellden of Flyvertaktisk Kommando ( = Air Tactical Command), what Maarup had seen was the landing light of a T-33 jet trainer. The following day Major Brons-Hansen, press officer of the Air Force, stated: 'The Air Force does not recognise the existence of unidentified flying objects. But on the other hand it cannot be denied that over the years we have received a number of observation reports in which we were not able to say what was seen. We have the greatest confidence in the police officer. He is a trained observer, and we do not seek in any way to dismiss this kind of observation. We look for an explanation, and already we can say for sure that no Air Force aircraft w responsible." Six pilots on the day of the sighting had flown over the location in T-33 trainers. Hone had seen or done anything unusual, though one recalled seeing a comet or shooting star, but could not specify the time and place. The landing lights can be switched on only when the aircraft were flying with their undercarriage down, so, normally, only when landing; on that Thursday evening landing approaches were being made from quite a different direction, so if there was an aircraft in Maarup's vicinity with its landing light accidentally switched on, it must have been after take-off rather than landing. This would mean it would be very noisy, whereas Maarup had heard no sound. Having rejected the aircraft hypothesis, the Air Force considered alternative natural explanations. A series of coincidences was proposed, involving a light reflected in a window and distorted by the hazy atmospheric conditions, or a static electricity phenomenon. The newspapers were full of accounts from other people who claimed to have seen something remarkable on the night of 13 August. Many had seen a very bright comet or shooting star at the same time as Maarup's sighting - some accounts suggested il was 3 to 6 times as bright as such phenomena normally are, with a long tail. The Air Force's last suggestion was that this was the basis of Maarup's observation. The Air Force investigation was finally closed on 6 November, in inconclusive fashion. Though it accepted that the light which Maarup photographed did not originate from his car, and though it could not explain what it was, it was confident it had nothing to do with CJFOs! Rather, a series of independent natural events had accidentally coincided. Questioned by SQFOI in 1972, the Air Force suggested that the power failure had been caused by a periodic or temporary technical failure, such as a slack cable terminal; though, because no such suggestion was; made at the time, the car was not investigated for [ such damage. Police Officer Maarup comes driving in his new patrol car. Suddenly the car is flooded by glaring light coming from an unusually bright comet; or alternatively from a T-33 jet trainer from Skrydstrup AFB. These normally fly at 2000 m minimum altitude, so either the landing or anti-collision light is extremely powerful, or the pilot has come down to a very low altitude in silence. Simultaneously the accumulate)! terminal cable in Maarup's car falls off, and power disappears. The jet plane hovers silently over the car for nearly two minutes with the full blaze of its light, then vanishes, at which point Maarup perhaps see another shooting star or something of the sort. The cable then jumps back into place and he is able to drive home. The contradictions and illogicalities of the Air Force investigation as reported by the press gave many people the idea that they were trying to mislead the public or to ridicule Maarup. The cover-up myth was fuelled when a newspaper reported that about a month after the sighting, a young woman told a GFO meeting that her husband, an Air Force radar operator, had been on duty the night of the sighting, and that a GFO had been tracked that night over a very long period. Nothing more is known of this claim; but SUFOI's investigation leads to the conclusion that the Air Force was telling all it knew and honestly seeking an explanation. Their final report shows that they failed to do so: yet though the object photographed by Maarup remains unidentified, the Air Force will not describe it as an unidentified flying object - doubtless because, for them, (JFO is synonymous with alien spaceship! So far as SGFOI is concerned, however, the Maarup case remains unsolved. 'On Tuesday 14 August 1973, at about 10.50 pm, I was driving in a patrol car. About 6 km north of Haderley 1 turned east along a secondary road, and soon afterwards became aware of an intense light over the field north of the road I was driving on. The light appeared from the air, lighting up a herd of cattle, and a couple of horses were rushing about bewildered in the beam. The light moved swiftly to the road where 1 was bringing my car to a stop: just as I stopped, my car was caught in the light and the car lights went out. 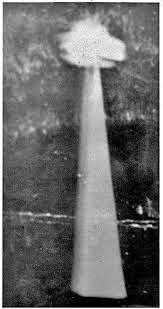 The beam approached slanting from the north, after which the object tilted about 45 degrees and stayed in front of the car in this slanting position; then it returned to the horizontal, then tilted 45 degrees to the opposite side. While the object was within range 1 took four photos with my automatic camera; unfortunately they show only a spot of light, but you can see how the object approaches from the left of the car, then rises to the right. When the object tilted, the outline and the lower surface of a huge object about 15 m in diameter, with three large domes protruding from the bottom, could be seen. After the object had moved in front of the car and again tilted to the opposite side, the light beam swept over the field south of the road, but soon after it began to retract As the object tilted 1 saw a low domed superstructure with windows all the way around. The windows were rectangular with rounded corners, as in a passenger plane. All of the windows were lit up, as if by daylight. The object was steel-grey in colour, but of a velvet-like texture. After the object had retracted the beam, it climbed towards the east, appearing as a huge disc. It gave a whistling sound like a strong gust of wind in trees as it disappeared at enormous speed. The entire sighting had lasted about 5 minutes.